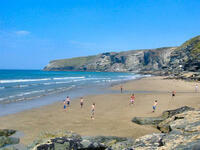 From Trebarwith Strand you can do a circular walk to Tintagel which goes along the coast past the castle. A circular walk in the other direction goes to Backways Cove with spectacular views over Trebarwith Strand from the top of Denis Point. Options for visiting Trebarwith Strand as part of a walk include Tintagel church to Trebarwith Strand, Trewarmett to Trebarwith Strand or Trewarmett to Backways Cove, or the walk along the coastline from Port Isaac to Tintagel.